Tall, lanky left-hander Zak Smotherman throws a sharply curving breaking ball that would fool even the most skilled of hitters. The pitch stuns the right-handed batter, as the umpire bellows out the verdict for the handful of fans. The batter, clearly upset, wipes the sweat off of his face with the sleeve of his Mass. Envelope jersey. He eyes Smotherman, of the Irish Village team, waiting patiently on the mound. 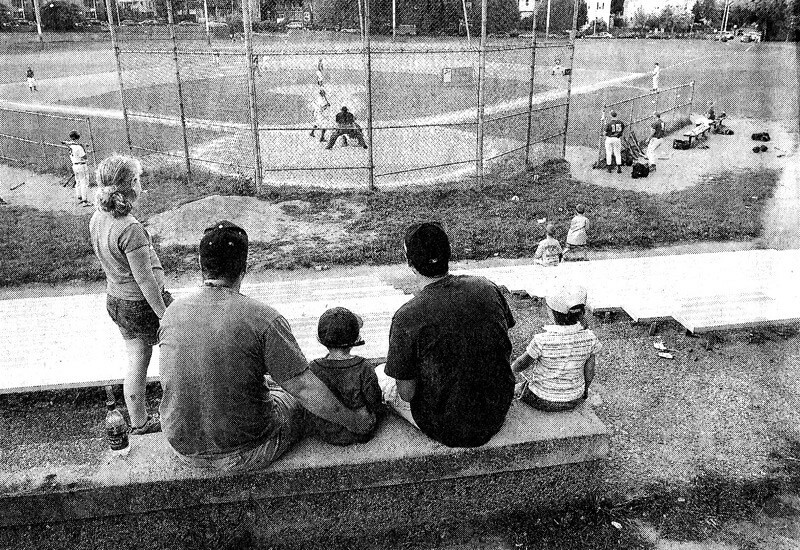 This is not a professional baseball game, but a hard-nosed match at Roslindale’s Fallon Field in what may be one of the best-kept secrets in the City of Boston. The Boston Park League, which has for years combined some of Boston’s most talented baseball prospects with former stars whose glory had faded, is in its 76th year. Although it seems, at times, forgotten, the league endures, despite setbacks in attendance, facility maintenance, funding, and a reduced pool of top-notch players. Most of the league’s athletes play college baseball in New England. All college divisions are represented in this wood-bat league. They play almost every night of the week, wracking up an entire college season’s worth of at-bats in just a few hot summer months, ending in mid-August. But this is a far cry from the Cape Cod Baseball League, with its pristine fields, legions of adoring fans, and rosters full of big league prospects. 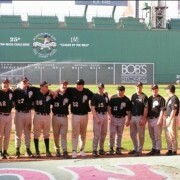 The Park League’s nine teams consist of players ranging from former minor leaguers to Boston-area high school stars. Some players are from Puerto Rico, while others have played in the world- renowned summer leagues of the Dominican Republic. Park League officials say it is the oldest amateur baseball league in the country. It was founded in 1929, almost 20 years before its Cape Cod contemporary. Its founder, the late Bob Cusick, was the director of the Boston Parks and Recreation Department until 1975. Cusick was a close friend of Ted Williams, Joe Cronin, and Tom and Jean Yawkey, among others in the Red Sox family. The league, his brainchild, became wildly popular from the 1940s through the 1970s. In the league’s heyday back in the 1950s, playoff games would attract crowds of 15,000 or more, often outdrawing the Red Sox, said league president and umpire Walter Bentson, a former player. 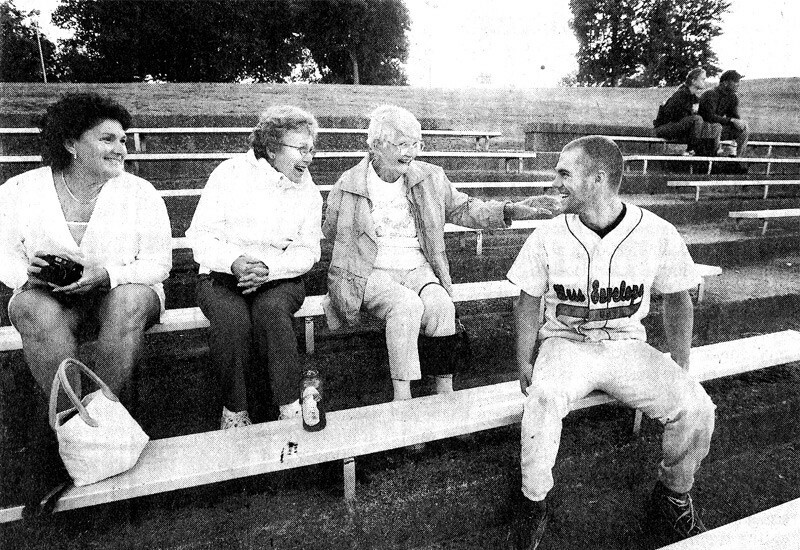 Player Matthew Moyen with his mother, Linda, and grandmothers, Phyllis Raffaele and Julia Moyen. Former Red Sox relief pitcher Mike Fornieles played in the Park League after his career in the majors ended in 1963. He couldn’t let go of the game he loved, playing several years for the Supreme Saints, and was one of a handful of players actually paid to do so a practice the league has long been unable to afford. Pete Varney, the current baseball coach at Brandeis University, played in the league after brief stints in the majors with the Chicago White Sox and the Atlanta Braves. Varney, a two-sport star at Harvard University, is celebrated as one of the heroes of “The Game” in 1968 when he caught the last-second conversion pass that enabled Harvard’s football team to “beat” Yale, 29-29. In the 1960s, two decades before he became Boston mayor, Ray Flynn was a feared Park League pitcher. League secretary treasurer Walt Mortimer, who many consider the best hitter in league history, came to the league after he was passed over for a trip to the majors while playing for a minor league affiliate of the San Francisco Giants in 1959. The player chosen ahead of him, Willie McCovey, became a Hall of Famer. Other notables who’ve played in the league include former Harvard equipment manager Chet “The Jet” Stone, Northeastern baseball coach Neil McPhee, Tufts coach John Casey, former Boston University coach Bill Mahoney, and former Boston College coach Mo Maloney. Despite all of this success, the Boston Park League has seen its share of ups and downs. Economic challenges have always plagued it. The City of Boston, which maintains the fields and facilities, withdrew its financial support in the ’80s due to budget constraints, and the Yawkey Foundation has funded the league for the last 20 years. An annual league golf tournament and dinner also raise funds. These days many believe that the level of play is comparable to the past yet the fan base is gone. “I don’t know what people are doing with their time these days,” said Maureen Smotherman, 56, whose son Zak plays for both Tufts and Irish Village. “I can’t think of a better way to spend an evening.” She and her husband, Bill, attend all of Zak’s games, keeping score at each contest. The birth and growth of some suburban counterparts have also played a role. And quality baseball is often on display. Today’s Carlson Club team boasts several former minor leaguers including former Red Sox single A catcher Rosendo Rentas; Pablo Reyes, a Park League Hall of Famer who spent time as a pitcher in the Toronto Blue Jays organization as a pitcher, and Pedro Martinez. No, not the future Hall of Famer, but this one did play for the Oakland A’s organization. 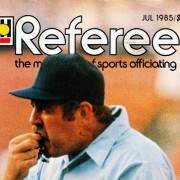 Sponsors pay for the critical supplies necessary to field a team, but the league pays about $20,000 a year to its umpires. Of the league’s $40,000 annual budget, says treasurer Mortimer, about $30,000 comes from the Yawkey Foundation. Copyright © 2005 Boston Globe, all rights reserved. Written by Matthew Burke.